JOIN US on Sunday, October 21st at the Historic Union Depot from 3 to 6 pm for the 6th Annual Goodnight Barn Dinner and Fundraiser. If you were with us last year you'll remember what a wonderful time we all had (and for a great cause). This year we have the best silent and live auctions we have ever had. You can view most of them on our Facebook page (www.facebook.com/goodnightbarn)as I add them to our event. Our entertainment will be Ole Doc Ezee and Disgo performing their Old West Medicine/Snake Oil show, Tom Munch will provide musical entertainment and, of course, there will be a visit from Blizzard & Boo the trained longhorn and an authentic chuck wagon on display. Jim Cook will be on hand with his impressive western and State Fair collection. And we will all enjoy a great dinner. 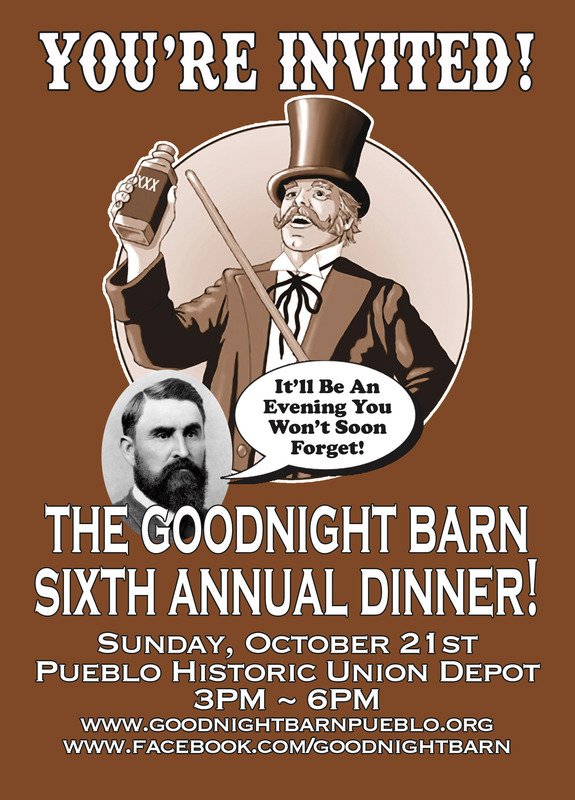 Reservations are due by October 15th and can be made by going to our website www.goodnightbarnpueblo.org and paying through PayPal. You don't need a PayPal account to purchase tickets, just a credit or debit card. Our price is the same as last year $50 for single tickets and $500 for corporate tables of 8. The bar will offer your first drink for free! Or perhaps you might want to enjoy some Goodnight Barn Elixer (a shot of Goodnight Bourbon!). Help us add to the $476,000 we have raised so far! Reservations through PayPal on our website www.goodnightbarnpueblo.org. For more information contact Laurel Campbell at laurelcampbell67@gmail.com or 719/250-9435.